A20N here, reprising the CAMP dialogue from last year. For the uninitiated, CAMP is a Beijing accelerator for Canadian startups. It is arguably the best China acceleration program in the world for international startups. I’ve written about it before: here, here, and here, among a bunch other places. All rights reserved A20N. Use only Original A20N. Accept No Substitute. So what this means is pretty clear, but how we arrived here perhaps less so. Let’s dive into that. 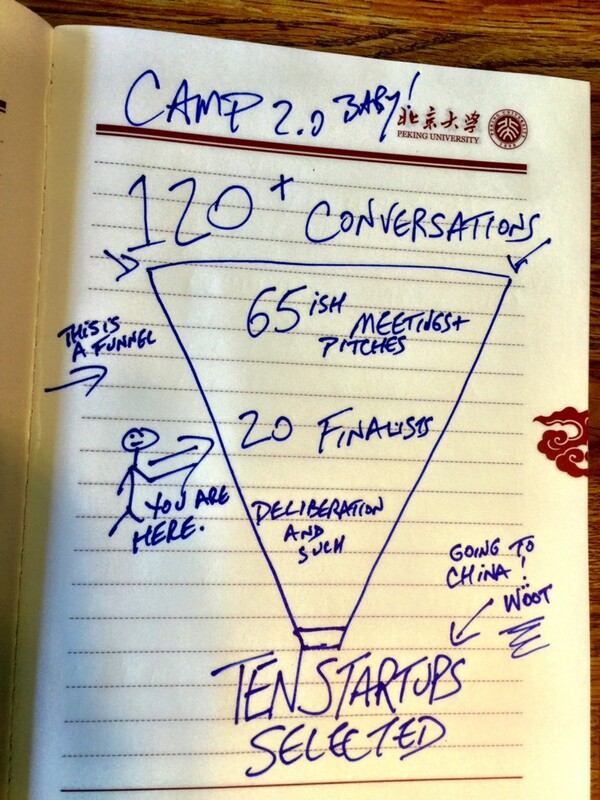 The most significant difference between CAMP 1.0 last year and 2.0 is the number of truly viable startups we’ve seen. In smaller part than we imagined, this is because 1.0 was limited to startups from Canada’s Ontario province (the largest, by far) while 2.0 has been for the entire nation. That said, the vast majority of applicants remained from Ontario, which I attribute to the strong contact base of many of our Executives-in-Residence (I am one of them) and the fact that Ontario remains the epicenter of Canadian startup activity. I think that the most important determining factor in how many strong startups we’ve seen is a shift in how we generated and took in applications. We worked a lot on our emerging CAMP brand in the short offseason from 1.0 to 2.0, build the new site (awesome work by Katerina Lyadova and her Oddbee team) and moved the application process there, which we also streamlined. And (this is absolutely key) we were much more proactive about reaching into our collective networks (and doing so early in) to actually begin the dialogue with startups. Maybe we deceived ourselves a bit during 1.0 that if we built it they would come. They did, and the 10 we picked were freaking amazing people and early-stage companies, but we just didn’t have the number and depth in the application pool that we hoped we would. Totally different game in 2.0, as I feel that we have close to 30 companies who could conceivably do well in the program. It wasn’t at all easy last week picking the 20 finalists, this I can assure you. So we’re entering into final pitches this week, the last chance for 20 startups to show us why they should have one of the ten spots. These spots come along with $250,000 in funding, a two-week bootcamp in Beijing, and access to some of the best entrepreneurial talent in China and the world. What will we be looking for over the upcoming days? 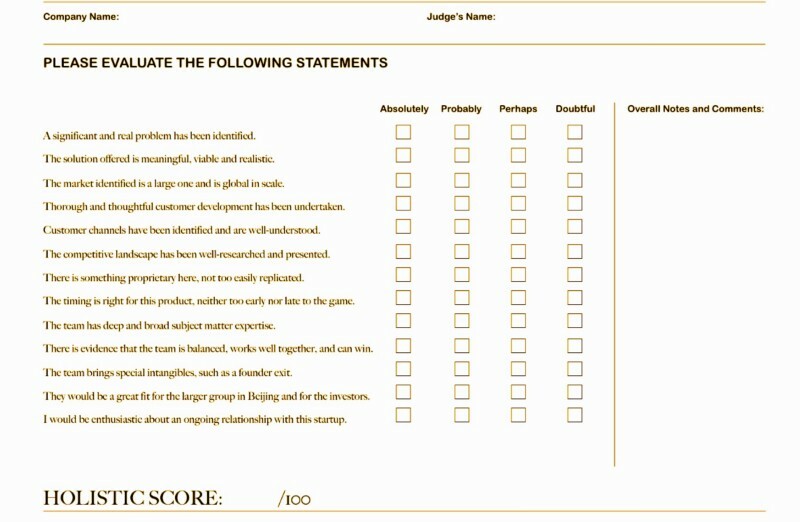 I built this, not as a firm evaluative tool, but as a way for us on the other side of the table to register our present sense impressions, which are critical in the passionate dialogue necessary to extract 10 from 20. Again, like everything else in CAMP, it’s not a traditional tool, but a little bit different — simple one way among many possible ways to frame our thoughts. And, please, feel free to steal it for your purposes. I think as a final lesson for us over the past year is realizing how much of a bear the entire process can be. When working with a global acceleration and investment program, things that you sometimes believe will be fast can be slow. And things that you think can be slow are often very slow. This year we’ve been better about managing ourselves, our timings, expectations, and realizing how big everything can be. It’s going to be an amazing week and we’re all looking forward to the — at this point — seemingly impossible task of going from 20 really talented finalists to the 10 we choose.